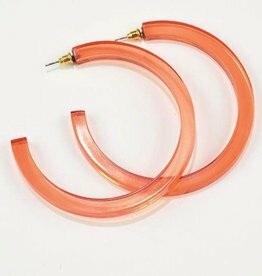 Our collection of lucite bangles and earrings make a simple, bold, pretty statement. 2.75"
Specify “Store Pickup” on check out and shipping charges will not apply. Pick up during store hours (specify Gainesville or Ocala location in “Comments”). Great gift for that Lady Gator for graduation, game day or just hanging out and looking loyal. Our collection of lucite bangles and earrings make a simple, bold, pretty statement. Effortless and versatile - the perfect accessory for the modern wardrobe.